On the way to the Junfermann Verlag book launch event for Genial Gengensatze (The Genius of Opposites) in Berlin I found this poster in a neighboring bar. 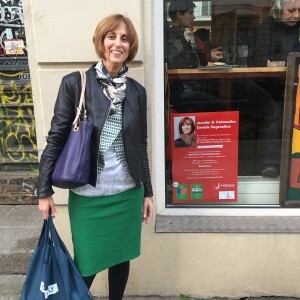 I lay awake the night of April 8th with the pre-trip jitters “Do I have my passport?””Will I make my connection?” Will any people speak English?” I was headed to Germany to speak at a series of events and the unknown was both exciting and unnerving. In recent years I have been fortunate to visit Australia, Singapore, Vietnam, the Netherlands, Spain, Canada and now Berlin to open up a dialogue about the importance of introverts at work. Every international trip I embark on transforms me and this one was no exception. 1. Be flexible in your communication – I don’ t speak German but I did discover that not knowing the language can actually have some advantages. Learning a few words and Incorporating them goes a long way. When you say “Guten Tag (Good Day)” it is greeted with smiles and a recognition that you are at least trying to connect. I also picked up on cues like voice tone, body language and words we use in English (like “goot (good)” and “manager” (manager) to piece together context. One night I even took a Yoga class (all in German of course) at my hotel’s gym and surprisingly, was able to follow along. The Yiddish language I heard in my home as a young girl and common German words like “Gesundheit” helped. And as my translator Ruben converted my words into German, I used that time to formulate my statements and synthesized the important points to convey. 2. Debate is not personal – When Germans challenge you it ain’t personal. Class discussion and question and answer sessions were marked by fiery debate and passionate, loud voices. People dissected ideas from all angles and they raised deeply provocative questions. Marta, a woman in one of my sessions unequivocally stated that introversion didn’t exist, only to return the next day, arguing the opposite position! My brain worked overtime and it was exhilarating to explore new research terrain. On a side note, before I left for Germany, I was at a retreat where I met Erica Jong, the famous author. She had just returned from her own book tour in Germany and said that she was impressed at how the Germans were “readers.” I concur and would add “provocateurs” to that description. They rarely take ideas at face value. 3. Arrive early . My German publishing liaison Stephan and I had a planned meeting at 6:00/18:00 p.m. for dinner prior to my book launch event for The Genius of Opposites and Quiet Influence. When I pulled up in my cab at 5:59/17:59, p.m. Stephan noted this with a smile of approval. Before driving me to see the Olympic Stadium, Dirk, my business partner picked me up in his car a minute after the appointed time and apologized for being late. A note to my American trainer friends: class participants were typically in their seats at least 10-15 minutes before the class start time. They took the chance to settle in and connect with others in low-key conversations. What a best practice we could adopt here! 4.Walk briskly. The Germans view walking and breathing as one in the same. It is a natural and done often! Also, as a native New Yorker, I thought I walked fast but was actually slow compared to my German colleagues. A 20 minute stroll to grab lunch was normal. Stephan kidded me about taking a cab for the 1.5 kilometers from the hotel. This would be a rare practice for a German coming that distance. No wonder Europeans are in good shape! 5. Introverts are being recognized. Though relatively new to the zeitgeist (another German word btw) the people I interacted with (many were coaches, psychologists and trainers) were intrigued by how they could incorporate knowledge of introversion into their work and their lives. Many of them identified with the traits of introverts. Discussions ensued about introverted leaders like Angela Merkel and the quiet strengths introverts use to influence and lead. Some insights even translated into real time changes. At the Eilert Akademie for Emotional Intelligence a quiet room was set aside for class participants to take breaks and recharge. And they did. That April pre-trip anxiety now seems far away. I want to sincerely thank Ute Eilert, Dirk Eilert and Ruben Langwara of The Eilert Akademie for Emotional Intelligence, Johanna Vondeling of Berrett-Koehler ,Dr. Stephan Dietrich of German publisher Junfermann and Britta Gansebohm of Der Literarrische Salon for making my German trip such a memorable one. One last learning? Humor knows no borders. Quiet Influence:The Introvert’s Guide To Making a Difference translates into into Die Starken der Stillen. Using Google Translate it is The Art of Breastfeeding. Upon learning this, my audiences had a good laugh and while I breastfed my daughters many years ago, fortunately none of my audiences expected a lecture on this topic! This entry was posted in introvert on May 2, 2016 by Jennifer Kahnweiler. Thank you for sharing these experiences, learnings and thoughts. where trains ALWAYS run on time, unless a blizzard hits Europe. Thank you for your comment Alan. I found the trains to be very efficient and was very surprised when one arrived a few minutes late! When were you in Germany? Thank you for sharing this, Jennifer. It was a great pleasure to meet you and Johanna in Paderborn. Heike – Thank you for your kind words and welcome. Our two publishing companies have what VP of Berrett-Koehler Johanna Vondeling calls a “mission match” and I agree. I look forward to our future collaboration! Loved this post. Great insight on taking cultural cues as well as the power of learning a few kay phrases! Thanks so much Barbara! I find that taking cultural cues is even important within our own country and in working with different clients! I am honored to receive your comment as you are the master/mistress of communication! I very much enjoyed your post. Your observations about German culture and habits are spot-on . As an American-born child of German parents, I can relate. Your comment about breastfeeding is funny. The German language has 3 genders: he, she, and it. “Die Staerken der Stillen” means “The Strengths of the Quiet Ones”. When talking about breastfeeding, you would say “das Stillen” (singular “it”) not “der Stillen” (possessive of the plural die Stillen, no gender). Google clearly missed this nuance! Amelie – So glad to have you validate my experience and clarify the distinctions around genders. I am starting to learn a little German and have realized that this “das” “die” “dar” thing might throw me off base! Your comment has helps. Thank you so much!